Can’t Boot Ubuntu after installing Nvidia Driver. NOTE – Go to this post to fix this problem. If that post didn’t helped you the do the steps in this post. A lot of people has trouble booting in to Ubuntu after installation of Nvidia Driver. Finally I had found a solution to this problem. You will now see a small dialog box. Click on OK Button. Press OK two or three times more. You will now boot into your Ubuntu OS. 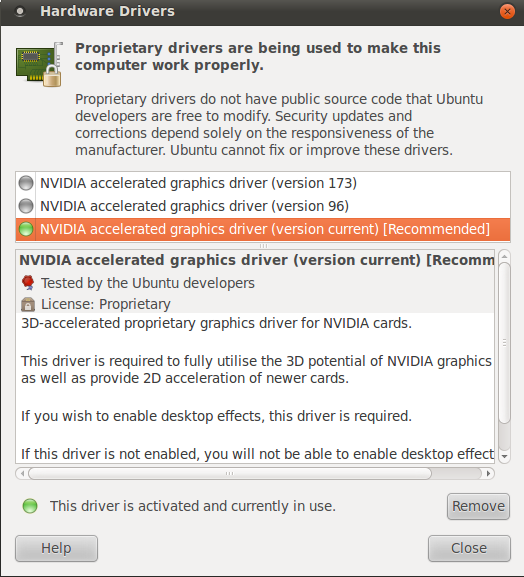 Open Hardware Drivers and install(activate) a recommended Nvidia Driver. Reboot and boot into Normal Ubuntu and your Ubuntu will boot just fine. If this doesn’t work ask me by commenting on this post or email me. How to open PHP files in Ubuntu instead of downloading.